Leaders has acquired Home Counties estate agency Aston Mead in a deal which brings it additional branches in two new areas, taking it past the 100 branch milestone. 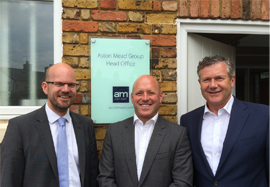 Aston Mead trades from Epsom, Walton-on-Thames, Weybridge and Woking where Leaders will be merging the business with its existing, well-established branches; as well as from Sunningdale and Chertsey which are new areas for Leaders and will take the firm to just over 100 branches. Leaders passed another significant milestone recently when it welcomed its 1000th member of staff following the acquisition of IMS Letting in Derby in June. Matthew Light, Leaders’ former finance director who recently took up the new role of acquisitions director, said: “We extend a very warm welcome to all our new staff and clients who join us from Aston Mead, and a special welcome to our new team in Sunningdale, which is our 100th branch. Leaders’ buy and build strategy has led to its successful expansion through the acquisition of good quality businesses with branches in areas where it has no branch presence, as well as the acquisition of property portfolios to strengthen its established branches. In most cases Leaders’ retains all the staff of the companies it acquires to strengthen its local market knowledge and ensure a continuity of service for its clients. Aston Mead is an award-winning estate agent with an outstanding local reputation. All the staff have joined Leaders whilst the vendors, brothers Adam and Charles Hesse who established the agency 15 years ago, have left the business. They will focus on their land, planning and new homes development business - www.astonmead.land - and will work alongside Leaders, referring new home sales to them in an ongoing business partnership. Commenting on the deal, Charles Hesse said: “The decision to sell your business can never be an easy one and when it came to deciding who the new owners should be we chose very carefully. We are delighted with our choice; Leaders shares our commitment to high standards in every aspect of its business, from customer service and the calibre of its staff, to its professionalism and integrity.